Set within 800 acres of parkland, Auckland Castle is a gothic style structure. 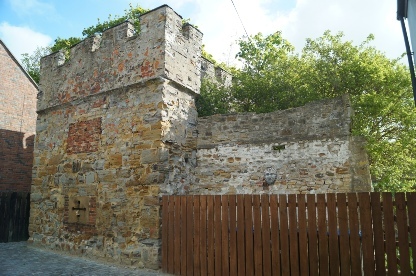 Having been extensively modified over the years, little remains of its former role as a fortification but the site gives a good insight into the Prince-Bishops of Durham. Castle is run by the Auckland Castle Trust. 1. Only 12 of the Francisco de Zurbarán paintings are originals. When Richard Trevor, Bishop of Durham acquired them, he was unable to obtain “Benjamin”. Instead he commissioned a copy to be painted to complete the set. The original still hangs in Grimsthorpe Castle in Lincolnshire. 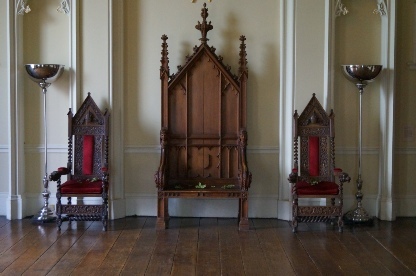 Throne Room. The Prince-Bishops were powerful rulers second only to the King. Defences. The defences were largely for show rather than substantive barriers against attack. Notes: The castle is located in central Bishop Auckland. No car parking immediately by the castle but various options throughout the town (most pay and display). One option is detailed above. Auckland Castle was a popular residence for the Prince-Bishops of Durham and evolved from a manor house into a minor castle in the thirteenth century. With only limited fortifications, it saw no military action but eventually became the principal seat for the Bishopric - a role it still performs today. William Walcher became the first Prince-Bishop of Durham in 1071. This post was appointed directly by the King (not the Pope) and treated as the equivalent of a senior Earl; the position had extensive secular powers with authority to raise armies, levy taxes, dispense justice and even mint coins. With a See stretching from the River Trent in the south to the Scottish border, the Prince-Bishop was responsible for the defence of northern England with authority over the secular magnates to provide a singular authority for mustering forces to counter any threat; a process demonstrated at key battles such as Alnwick (1093 and 1174), Northallerton (1138) and Neville's Cross (1346). Although the principal seat was at Durham Castle, a manor house was constructed at Auckland in 1183 by Bishop Hugh Pudsey who was attracted to the site due to the adjacent park which offered superb hunting facilities. Bishop Antony Bek succeeded to the See in 1283 and made a number of modifications including converting the site into a substantive castle. The extent of these fortifications in unknown although they are likely to have been rudimentary; the castle was first and foremost a residence. Nevertheless, the castle’s relationship with the Prince-Bishops inevitably saw it embroiled in national events. In 1346 the English army mustered in the castle’s grounds prior to marching towards Durham and victory at the Battle of Neville’s Cross. The wealth of the Bishopric of Durham saw it targeted by the Commissioners of Henry VIII during the dissolution of the monasteries. Durham cathedral was raided in 1537 and the adjacent monastery itself was suppressed in December 1539. However Prince-Bishop Cuthbert Tunstall dutifully accepted Henry VIII as Supreme Head of the Church of England and the break with Rome undoubtedly saving much of his wealth including successfully retaining Auckland as a residence. Tunstall was later arrested and deprived of his Bishopric upon the accession of Elizabeth I in 1558. During the Civil War Auckland, lacking any serious fortifications, saw no action. But following the defeat of the King, the wider Bishopric suffered under the Puritan focused policies of the new regime. Confiscated from the church, Auckland was sold in 1646 to Sir Arthur Haselrigg who demolished the chapel and started work on a lavish mansion. Haselrigg had been one of the five MPs that King Charles had attempted to arrest in 1642 and had subsequently fought against the King. Although he was instrumental in the downfall of Richard Cromwell in 1658, he opposed the restoration of the monarchy and attempted to frustrate General Monck as he moved his army into London in support of Charles II. 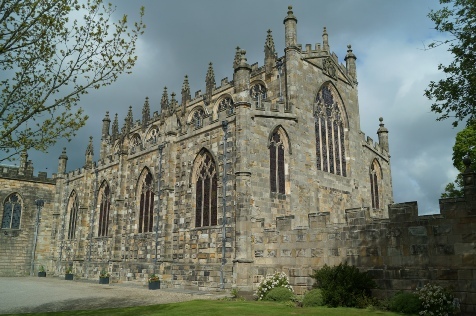 His actions failed and, after the Restoration, the Bishopric of Durham was re-established and Auckland Castle taken back into church ownership. A new Prince-Bishop was appointed, John Cosin, who demolished Haselrigg’s unfinished mansion and significantly rebuilt the castle. The twelfth century banqueting hall was converted into a chapel and the surrounding structures were renovated and repaired after decades of neglect. Haselrigg himself was imprisoned for life in the Tower of London where he died in 1661. Like nearby Durham Castle, Auckland underwent some Gothic stylisation at the hands of architect James Wyatt in the late eighteenth century. The new residence was sufficiently grand that it became the principal seat of the Bishops of Durham in 1832 when William van Mildert gifted Durham Castle for the foundation of the University. He was the last of the Prince-Bishops as their secular powers were revoked with the Durham (County Palatine) Act (1836). Nevertheless the site continues to be used by the Bishops of Durham and is his official headquarters. In July 2012 the site came under the care of the Auckland Castle Trust and has now been opened to the public.